The poppy has a long association with Remembrance Day, the day to commemorate soldiers who have died in war. In late 1914, the fields of Northern France and Flanders were once again ripped open as World War One raged through Europe’s heart. Once the conflict was over the poppy was one of the only plants to grow on the otherwise barren battlefields. The poppy came to represent the immeasurable sacrifice made by all the soldiers in the Great War and quickly became a lasting memorial to those who died in World War One and later conflicts. It was adopted by The Royal British Legion as the symbol for their Poppy Appeal, in aid of those serving in the British Armed Forces, after its formation in 1921. The poppy helps to provide thousands of modern veterans, Service men, women and their families with vital advice and support. Today we want to talk to you about Assassin’s Creed, a historical fiction action-adventure open world stealth video game serie. Set within London in 1868 during the Industrial Revolution, the story follows twins Jacob and Evie Frye as they navigate the corridors of organized crime during the Victorian era and fight against the established order, controlled by the Templars. 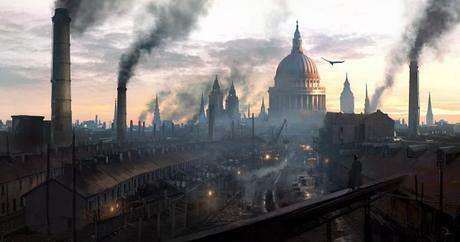 In 1868, at the tail end of the Industrial Revolution, with the Assassin Brotherhood all but eradicated, twins Jacob (Paul Amos) and Evie Frye (Victoria Atkin) leave Crawley for London and arrive to find a city controlled by the Templars, with both the Church and the Monarchy losing their power. Raised as Assassins to follow the Creed, Jacob and Evie aim to take back the city from Templar control by infiltrating and uniting London’s criminal underworld, aided by notable figures of the era such as novelist Charles Dickens, biologist Charles Darwin, inventor Alexander Graham Bell, Nurse Florence Nightingale, Duleep Singh, the last maharajah of the Sikh Empire and Queen Victoria. Here you can see a video to compare real life vs. in-game. It is a great art job which can help us to see how London was at that time. We encourage you to download our app and get to know some of the charater mentioned above and more stories about the city, with hundred of ilustrations. After the restoration of the Stuart monarchy in 1660 under Charles’s son, King Charles II, nine surviving regicides who had participated in the trial and execution of Charles I were tried, convicted and sentenced to be dragged through the streets, hung by the neck and cut down live, disembowelled while alive, beheaded and dismembered. In addition, Charles II’s new Parliament ordered the disinterment from Westminster Abbey and theposthumous execution of the deceased regicides Oliver Cromwell, John Bradshaw and Henry Ireton. On the morning of 30 January 1661, the anniversary of the execution of King Charles I, the corpeses were dragged through the streets of London, hung in full public view, beheaded and buried in a common pit. The heads were placed on a wooden spike on a 6 metres pole, and raised above Westminster Hall. Cromwell’s head remained there until the late 1680s when a storm broke the pole throwing it to the ground. After then, it was in the hands of private collectors and museum owners until 25 March 1960, when it was finally buried at Sidney Sussex College in Cambridge.